When I was a kid, one of the few Star Wars vehicles I had from the Kenner line was Luke’s Landspeeder. I remember how cool it was. With the lever to activate the “floating action”, it was a fun toy. I remember when my mom bought it for me at a local toy store, and I remember taking it with me everywhere – even the doctor’s office. Sadly, one day I left it outside in our front yard when Mom called us in for dinner. When I went back outside to get it, it was gone. Some pesky Jawas must have made off with it while I was eating! Overall, it was in good condition. 90% of them out there have yellowed windshields, it’s just something that happens to the plastic over time. Really, the speeder just needed a good cleaning, replacement stickers (It appeared that the original owner put the decal under the hood on backwards, then tried to remove it to fix it and tore it. No problem), and SEATS! I took the speeder completely apart and washed it in warm soapy water, getting rid of years of dust. I scrubbed in all of the nooks and crannys with a soft toothbrush. The springs in the wheel mechanism were in good shape but were full of dust and lint. I cleaned them out as well. The chrome is actually in better shape than I’ve seen on some $20.00 speeders. I printed up some replacement decals, using a scan I downloaded at 12back.com ( Click for the Sticker scan ). They aren’t perfect, and I’m on the lookout for better stickers or a better scan, but they’ll suffice. I glued them in place using 3M spray adhesive. 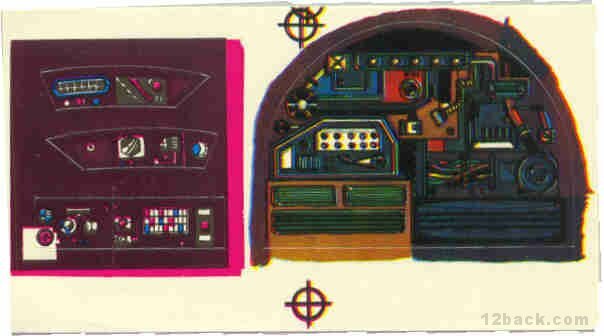 Previous PostR2 Progress – Leg StrutsNext PostVintage Kenner Death Star Space Station Playset! !